Follicular unit transplantation (FUT) is a common surgical hair restoration technique that involves transplanting a patient’s natural hair into balding areas. This procedure allows patients suffering from extensive hair loss to regain their head of hair with minimal trauma to the scalp. The highly skilled team at True & Dorin Medical Group routinely provides this life-changing treatment with outstanding results. 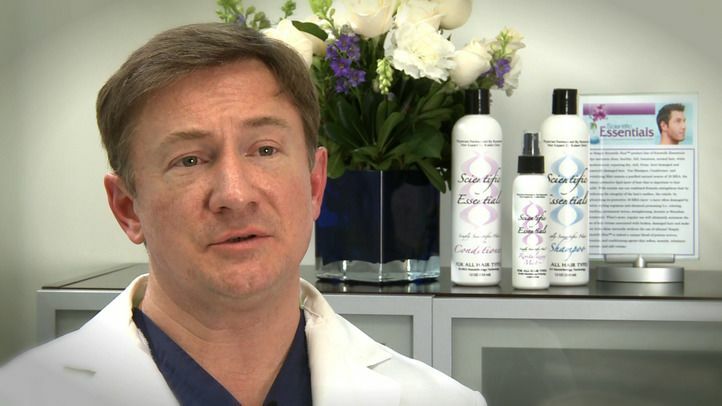 Having performed thousands of FUT procedures, Dr. Robert H.True and Dr. Robert J. Dorin have refined the process and made this technique's results highly predictable. A: Follicular units are the natural groupings in which hair grows, usually made up of one to four hairs. Under magnification distinct bundles of single, double, and triple units are evident. Each unit shares the same blood supply, and the integrity of the unit is preserved in the transplantation process. Because of this elemental concept, nothing of an artificial nature is ever transplanted because these groupings naturally exist. This allows us to achieve consistently natural-looking results for patients using their own hair. Planning: Before beginning the procedure, you and your doctor will determine the design of your hairline for the most aesthetically pleasing results. Preparation: The treatment area is then prepared by trimming the donor site. Extraction: Local anesthesia will be administered using the CompuMed® Wand. The doctor will carefully excise a strip of skin and suture the edges back together. Creation of Grafts: Your doctor will create individual grafts from the follicles using a microscope for optimal precision. With this technique, the number of grafts transplanted will equal the number of follicular units that are present in the donor strip before it is harvested. Placement of Grafts: The donor grafts are then ready to be placed. The follicles will be implemented from front to back in the pattern that has been previously determined. Starting at the front of the hairline, the doctor will make the smallest of incisions. As he makes his way to the back of the scalp, he will place larger grafts to create fullness as you would see with natural hair growth. Typically, the procedure will take about three to six hours. Patients of hair loss doctors True & Dorin can expect a comfortable and quick hair transplant recovery. The healing process is generally painless, and takes about 7-10 days. Patients can typically leave the office not only bandage-free but with minimal to no noticeable signs of surgery in the donor area. In many cases, the patient's existing hair will not only cover the donor stitches but may cover the recipient area as well. If not, you may choose to wear an adjustable baseball cap after the procedure. Patients who wish to be especially discreet about their treatment typically take time off from work. Patients can expect tiny scabs in the transplanted area as well as moderate soreness in the donor area. After 10 to 12 days, the scabbing should be healed and stitches will have been removed. Patients generally only experience mild to moderate pain, which can be easily controlled by prescription medications over a one to three day period. The ideal interval between FUT treatments sessions is about 10 to 12 months. After recovery, patients can expect a fuller head of hair with minimal visible scarring. Some early advocates of follicular unit extraction (FUE), an alternative method, have exaggerated the risks of wide donor scars with FUT strip harvesting. However, patients considering FUE versus FUT with strip harvesting at True & Dorin Medical Group should rest assured that our doctors will complete your procedure with the utmost care and precision, significantly reducing scarring. Dr. Dorin and Dr. True believe in providing individualized treatment to each and every patient, achieving the best hair restoration results possible. Contact us online or by phone at (866) 629-0866 to schedule your consultation. We can answer any of your questions about the advantages of FUT, your candidacy, and related costs.